We Be Reading: Happy Thanksgiving! To all of our American readers at home and abroad, have a wonderful Thanksgiving weekend! Yes, the turkey has eyebrows hovering up above his head. He's the only one surprised at what is going to happen to him today. Poor little turkey. He's alarmed and surprised. He's going to suffer. Happy Thanksgiving weekend to y'all too! Love this!!! 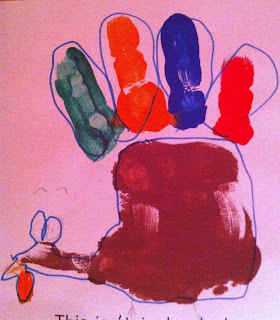 And I love all the different colors ... usually these hand turkeys are just one color. Jenners - Another parent and I actually went in and helped paint the kids' hands all of the different colors. It was fun because they picked which finger to put what color on. One girl said "I want green on my pinkie because I've always liked green pinkies". Like she's come across this situation before!